Enter Banquo, and his son Fleance, with a Torch before him. FLEANCE: I take't ’tis later, sir. Banquo, about to be murdered by agents of Macbeth. Fleance, about to escape those same assassins and flee for his life to Wales. It is so dark they cannot see the stars. All is gloom, within and without. Banquo cannot sleep, so terrible are his premonitions. I spent Friday night through Monday morning with my son. It was a wonderful time. Yet, like Banquo, my sleep since he left is troubled. Not for myself, but for my country. Odd, then, that while picking up today I came across a slim book that has been covered for months (perhaps years) by newspapers and computer-printed articles. It is a volume I've had since I bought it in 1966 when I was fourteen -- now dog-eared, its cheap paper browning. 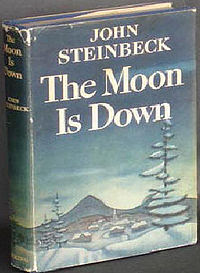 The Moon Is Down was written by John Steinbeck in between Pearl Harbor and the fall of Bataan. It was a dark, dark time. No one could know then how the war would end. The candle of western civilization was guttering in the wind and within one stiff breeze of going out. The Moon Is Down was John Steinbeck's first attempt at war propaganda, yet he wrote better and deeper than the average wartime efforts of other writers. Far better. The work was an instant best-seller. In time it was turned into a play, then within a year, into a movie starring Cedric Hardwicke, Henry Travers and Lee J. Cobb. Forty years later, John Milius used it as the basis for his 1984 movie, Red Dawn. "By ten-forty-five it was all over. The town was occupied, the defenders defeated, and the war was finished." So opens The Moon Is Down. Only it becomes rapidly apparent that the war is NOT over. The town is taken, the strategic coal mine is secured, the guns in private hands are seized (thanks to a well-placed collaborator), the people are stunned at the sudden turn of events, but the war is not over. The amazing thing to me is how Steinbeck reached down into the awful darkness that was by no means make-believe, and pulled out a story of eternal humanity and liberty that became not only a light in the darkness to those who hadn't been conquered, but a resistance manual to those who were living under the Nazi boot. While some American critics faulted the novel for its sympathetic portrayals of Nazi soldiers, the book was widely popular in Europe. The Moon is Down was reprinted in French and distributed by the resistance fighters of the Maquis. These were books printed under the very noses of the Gestapo. It was also banned in Italy, where the penalty for reading the book was death. Yet its message resonated. The plot device of the Mayor's request for explosives to be air dropped so that the townsfolk can wreck the mine and the railroad -- a sabotage campaign that he understands in advance will lead to his death -- was noticed by Winston Churchill himself. After reading The Moon Is Down, Churchill ordered the Special Operations Executive to explore this idea and it became the basis of Operation Braddock, a British sabotage and propaganda campaign. Not bad for a mere work of fiction, turned out by a man who had never lived through the events he described. Only one of the soldiers has ever experienced war before, and even Colonel Lanser is under the illusion that he will avoid the inevitable terror of war-time occupation. "Lanser had been in Belgium and France twenty years before," Steinbeck writes, "and he tried not to think what he knew--that war is treachery and hatred, the muddling of incompetent generals, the torture and killings and sickness and tiredness, until at last it is over and nothing has changed except for new weariness and new hatreds." In his fast-paced, dialogue-ridden, play-like style, Steinbeck creates a hopeless situation. The soldiers gradually go mad, or they die mysterious deaths as they go out alone, searching for human companionship and kindness. It becomes obvious to the villagers that resistance is not futile. 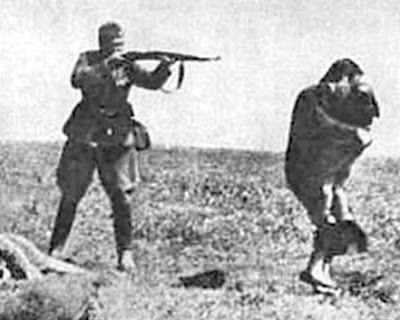 As their collaborative hatred grows, and as martyrs are made of their most-beloved citizens, the people become a force. Dr. Winter says, "all invaded people want to resist." And Mayor Orden says, "I am a little man and this is a little man, but there must be a spark in little men that can burst into flame." It's much more than about simply living or dying, winning or losing. The book forces the reader to reevaluate conceptions of humanity and justice. "The people become a force." Indeed. Dr. Winter, himself eventually a hostage along with the Mayor and scheduled to be shot, observes, "all invaded people want to resist." So they do resist, and occupiers are killed, or they disappear. Then the sabotage campaign begins. Lanser said . . . "Orden, these things must stop. And the Mayor smiled helplessly at him. "They cannot stop, sir." Colonel Lanser said harshly, "I arrested you as a hostage for the good behvior of your people. Those are my orders." "But that won't stop it," Orden said simply. "You don't understand. When I have become a hindrance to the people, they will do without me." Lanser said, "Tell me truly what you think. If the people know you will be shot if they light another fuse, what will they do?" The Mayor looked helplessly at Doctor Winter. . . Lanser pressed him. "What will they do?" "I don't know," said the Mayor. "I think they will light the fuse." "Suppose you ask them not to?" . . .
"I am not a very brave man, sir, I think they will light it, anyway." He struggled with his speech. "I hope they will, but if I ask them not to, they will be sorry." . . .
"But you think they will light it?" Lanser insisted. The Mayor spoke proudly. "Yes, they will light it. I have no choice of living or dying, you see, sir, but -- I do have a choice of how I do it. If I tell them not to fight, they will be sorry, but they will fight. If I tell them to fight, they will be glad, and I who am not a very brave man will have made them a little braver." He smiled apologetically. "You see, it is an easy thing to do, since the end for me is the same." Lanser said, "If you say yes, we can tell them you said no. We can tell them you begged for your life." And Winter broke in angrily, "They would know. You do not keep secrets. One of your men got out of hand one night and he said that the flies had conquered the flypaper, and now the whole nation knows his words. They have made a song of it." . . .
Orden . . . said quietly, "You see, sir, nothing can change it. You will be destroyed and driven out." His voice was very soft. "The people don't like to be conquered, sir, and so they will not be. Free men cannot start a war, but once it is started, they can fight on in defeat. Herd men, followers of a leader, cannot do that, and so it is always the herd men who win battles and the free men who win wars. You will find that is so, sir." Within minutes, the sound of an explosion is heard on the wind, and the Mayor is taken out and shot. So what does this, if anything, have to do with the situation we find ourselves in today? We are not the victims of foreign invasion, are we? Yet, aren't we? We are, as I have observed before many times, two nations sharing the same language and birthplace. There is little in common we share with the collectivists, the "herd men" as Mayor Orden called them. It is as if we have experienced an "Invasion of the Body Snatchers." They look like us, they talk like us, but they are NOT us. And yet even now we are willing to coexist in peace with them, if they but leave us alone. BUT THEY WILL NOT LEAVE US ALONE. They have said so, repeatedly. This is particularly true when it comes to their appetite for our firearms. And so it is that The Moon Is Down still speaks to us of eternal truths, now, today, in the 21st Century. It is just as prescient, just as valid as it was in 1942 when it was written, almost as a forlorn hope. We should remember, even if our collectivist enemies do not, that as Mayor Orden told the Nazi colonel, "it is always the herd men who win battles and the free men who win wars." Remember that. For now, as then, we live in a time when the moon is down. But it will rise again. The Three Percent will see to that. Wow... As powerful a call to arms as there has ever been. Is the flag in the top right corner real? If so, where can I get one? If not, how can we arrange to have them made? No one can stop us but ourselves. Our enemies can trick some into compliance. If we resolve to give our all they smply cannot stop us. Glad you got the allusion. What can come after the moon goes down, but the rising of the same? The flag is soon to be offered for sale, with all profits plowed back into the fight. When it is available, I will let everybody know by blog. Enjoyed this piece alot, sometimes I wonder if we will not have the same type of struggles. Glad to hear the flag will be ready soon, definely want one. Keep up the good work Mike....what you are doing is very important. Yes, By the rising of the Moon. (Best sung by the Clancy Brothers). "Death to every foe and traitor." If only we had such songs of resistance as do the Irish. But no reason we cannot take them as our own. Just forwarded this on, with a comment at the top of the page: "Let it be known, I am not a "Herdman," and, the war I must fight appears to be on the horizon..."
I'm in Baghdad, and, it's difficult to get online for surfing very often, but, we'll probably be ordering more than one of the IIIper Flag, soon as this gets through circulating.